Since taking his post as Israel’s ambassador to the United States in 2013, Ron Dermer has refused to meet with J Street, a liberal Middle East advocacy group. He has likewise not engaged with other left-leaning Jewish groups often critical of the Netanyahu government. Recent polling has shown that Democrats and Republicans are diverging on their views about the seemingly intractable conflict. The Pew Research Center found in January that 79 percent of Republicans “sympathize” more with Israel than the Palestinians, compared to just 27% of Democrats — of whom about an equal percentage supported Palestinians more. In the last election, 71% of US Jews voted Democrat. Beyond J Street, which has sent multiple written requests for a meeting since Dermer assumed his post six years ago, and for him to address its galas and conferences, the ambassador has not met with other leading left-wing Jewish groups, including the New Israel Fund or Americans for Peace Now, according to sources with knowledge of the situation. Those groups, however, have not sought a meeting in the frequent and persistent way J Street has. A source with Americans for Peace Now said a meeting was initially scheduled years ago, but Dermer then had to travel out of town. Since then, the organization has not “pursued it diligently,” the source said. But neither was any engagement initiated on the ambassador’s end. Despite repeated requests, Ambassador Dermer declined to comment for this report. In public comments, Dermer has highlighted the importance of bipartisan support for Israel. Dermer’s predecessor, Michael Oren, who held the post from 2009 to 2013, regularly met with J Street and other progressive Jewish organizations. This starts with occupation. There’s an apartheid state in Gaza. There’s an apartheid state in the region. That’s what we need to talk about. That’s what starts as resistance. It’s not terrorism. Two activists from the Boycott, Divestment and Sanctions campaign disrupted the presentation of an Israeli Holocaust film in Berlin last week, prompting Israeli security officials to evict the protesters as the audience booed the stoppage caused by the BDS people. Yisrael Medad: Again, Is “Palestine” Really Part of Syria? It is the Yom Kippur War for Israelis. It is the October (Tishrin), Ramadan or Freedom War for the Egyptians. Fought 45 years ago, it retains an importance in both societies far beyond many other wars. In Israel, the 1973 War is a source of both contention and pride; in Egypt it is a source of pride, and even more importantly, a source of justification for Egypt’s decision to opt out of war-making against Israel ever since. Nearly a half-century later, it is important to note how the war is remembered and understood by the chief protagonists. A comparison between the well-written and well-documented Wikipedia entries on the war, one in Hebrew and one in Arabic, is a good way to gauge the basic assessments of the war in Jewish and Arab societies. The comparison is only valid if of course the two entries are not mere translations, which they clearly are not. This can be easily ascertained by the many sources they cite. The Hebrew entry cites works in Hebrew and English including sources such as the memoirs of Sa’ad al-Din Shazli, the Egyptian chief-of-staff, written in Arabic and subsequently translated into English. The entry in Arabic cites sources in English and Arabic including sources written in Hebrew and subsequently translated into English. The Arabic entry includes one source in Russian. Both entries then suffer the same deficiency that they were written by experts who did not know the language of the protagonist, which is clearly characteristic of many of the scholarly works on the war and an obstacle to achieving objectivity. The University of Michigan is again under fire for anti-Israel sentiment, as a pro-BDS instructor rejected a Jewish student’s request for a letter of recommendation to study in Israel for a semester, just a few months after an associate professor refused to do the same for student Abigail Ingber. Rock-n-roll BDS-hole Roger Waters has been booed at the first of eight concerts in Brazil, after the name of front runner Jair Bolsonaro’s name was included on a list of “fascist” world leaders projected on a wall on stage (which also included U.S. President Donald Trump). Good to see Waters is beginning to grate on many more people. It is just a shame there weren’t any tomatoes nearby. 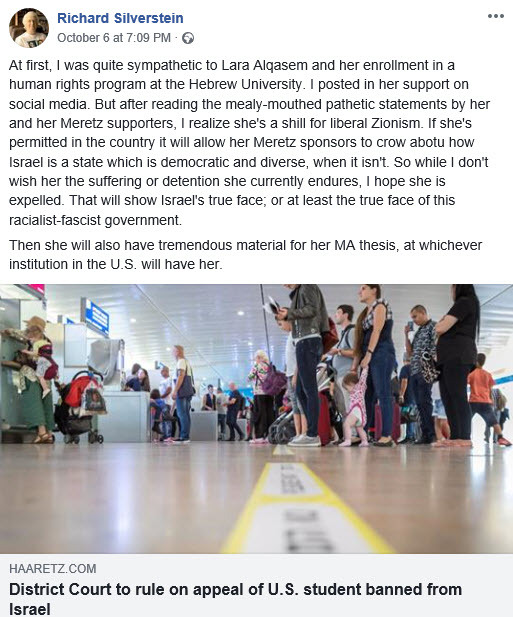 There is nothing wrong with debating the Israeli policy that has seen the refusal to allow entry for Lara Alqasem, an American student BDS activist, to study at Jerusalem’s Hebrew University. There has even been criticism from Deputy Minister in the Prime Minister’s Office Michael Oren, as well as pro-Israel columnists Bret Stephens and Bari Weiss in the New York Times. There is something particularly strange, however, about a letter in The Guardian signed by more than 300 academics calling on the Israeli authorities to permit Alqasem to enter Israel and pursue her studies. While it might be possible to trawl through the list of signatories to ascertain their motives for adding their support to the letter, it’s entirely possible that most are motivated not by a hatred of Israel but by genuine concerns for academic freedom. All of them are prominent supporters of the BDS campaign in the UK and advocates for the academic boycott of Israel. Hilary and Steven Rose even led the call for a moratorium on European research collaboration with Israel in a 2002 open letter that marked the beginning of the call for an academic boycott of Israel. 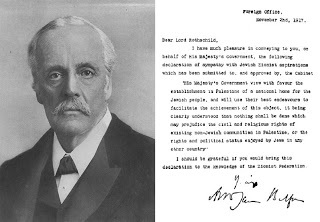 Later they participated in setting up BRICUP, the British Campaign for the Universities of Palestine and PACBI, the Palestinian Campaign for the Academic and Cultural Boycott of Israel. Two Jewish pro-Israel New York Times columnists have excoriated Jerusalem for what they say are “paranoid policies” over the continued detention of an American graduate student at the airport over her alleged support for the Palestinian-led boycott campaign against the Jewish state. The column by conservatives Bret Stephens and Bari Weiss in support of Lara Alqasem reflected what analysts say is growing unease in the US Jewish community, even among staunch Israel supporters, with hamhanded policies pursued by the Netanyahu government. Alqasem has denied she supports the BDS (boycott, divestment, and sanctions) campaign against Israel, and has remained in custody for the last eight days while she appeals the deportation order. Israel says she is free to leave the country should she choose to do so, but she is fighting a court battle to be allowed in. The Hebrew University is backing her. In a joint Wednesday op-ed titled “Why is Israel afraid of this young American?” Stephens and Weiss write that by expelling its harshest critics, Israel is only reinforcing their prejudice. This claim that young American Jews are “increasingly alienated from Israel because of its hard-line policies” doesn’t stand examination. That reviewer was Bret Stephens himself, writing in 2012. Much of the hearing also revolved around when, if ever, Alqasem, ceased BDS her activity. While Ben Hillel said that she had stopped supporting BDS in April 2017, state prosecutor Yossi Zadok said they had information that she had continued involvement with BDS even into 2018. When pressed about what the evidence was, Zadok said they had information that she had previously posted her intent to attend BDS events in 2018 and later erased the posts. Zadok implied that erasing the posts also showed dishonesty and a cover-up. “Is this what we have come to?” Ben Hillel responded with indignation. He said that many people post on Facebook that they might attend an event without actually attending and that many also erase prior activism posts for a variety of reasons. According to Ben Hillel, a 2017 law allowing the state to block BDS supporters from entering Israel only applies to current BDS leaders. Alqasem ceased being president of the Students for Justice of Palestine at her university, where he said there were only eight members and the group had little impact, over a year and a half ago, Ben Hillel said. For that reason, the state had no basis to prevent her entry now, he argued. But Zadok responded that the state has wide discretion to prevent people from entering the country and has previously used that discretion on persons for their activities even decades before – let alone only 18 months ago. He was also adamant that the state disputed Alqasem’s story about when she had stopped her BDS activity. An Israeli court heard an appeal on Thursday from a BDS activist denied entry into the country. This is the second known such case this month. Isabel Phiri, a senior official in the World Council of Churches, which represents about 350 churches of various denominations, was rejected in December 2016 from entering Israel to partake in the WCC’s annual Ecumenical Accompaniment Programme in Palestine and Israel. EAPPI, whose mission is to bring thousands of volunteers to Judaea and Samaria to “witness life under occupation,” receives funds from many European governments and church groups. EAPPI also trains anti-Israel activists. His reaction? You couldn’t make it up! Yup, because she says she no longer supports a boycott of Israel, she is a “shill for Liberal Zionism” and Israel should expel her so that Israel can look bad. Silverstein is clearly not right in the head and seems to have boycotted his own brain cells. The good news for him is that this does not disqualify him from continuing to appear on Iranian propaganda outlet Press TV and represent himself as a “journalist”. On the contrary – his outlandish hatred of Israel makes him a great choice as regular guest. The Jerusalem Magistrate’s Court has ruled that two New Zealand Boycott, Divestment and Sanctions activists must pay damages totaling NIS 45,000 for their role in the cancellation of a scheduled Lorde concert in Tel Aviv. On Wednesday, Judge Mirit Fohrer ruled that activists Justine Sachs and Nadia Abu-Shanab must pay the damages to three Israeli minors named in the lawsuit who had purchased tickets to the concert. The suit was filed in January by attorney Nitsana Darshan-Leitner, president of the Shurat HaDin NGO. Jews in the AfD hope to engage the party about incidents, policies and statements that have been cited as proof of anti-Semitism endemic to the party. For instance, the AfD platform forbids kosher ritual animal slaughter, which subsumes the Jewish shechitah—a target of the Muslim population. Other oft-cited problematic AfD statements include AfD chair Alexander Gauland calling the Holocaust a “bird speck in glorious German history,” and regional parliament member Björn Höcke saying the grand Berlin Holocaust memorial is a “monument of shame.” JAfD doesn’t necessarily see these comments as trivializing the Shoah, believing such words have been interpreted out of context or overplayed by the media. “I prefer to be part of a party that wants to help living Jews, not dead Jews,” Fuhl said to applause. Budo for Peace – a non-profit organization that brings together youths from diverse social, religious, ethnic, socio-economic and cultural backgrounds amid martial-arts training – has been named a regional finalist in the 2018 Peace and Sport Organizations’ annual awards. The winner will be announced at the Peace and Sport Regional Forum in Rhodes, Greece, on October 18. Budo is a Japanese word that describes modern martial arts. The Peace and Sport Organization was founded in 2007 by French athlete Joe Bouzo, who competed in modern pentathlon contests in four Olympic Games, winning bronze and gold medals. Prior to his Peace & Sport global initiative, he founded a similar French organization, Rassemblement par le Sport, whose mission is to use sport as a platform for socially integrating young people who live in areas where conflict and violence are rife. Budo for Peace was founded in 2004 by Danny Hakim, an Australian-born businessman, philanthropist and martial-arts champion. TV presenter Lucy Aharish and actor Tzachi Halevy got married Wednesday night at a small private ceremony near Hadera. Google will begin offering its pay-to-carpool service throughout the U.S. in an effort to reduce the commute-time congestion that its popular Tel-Aviv-based Waze navigation app is designed to avoid. The expansion announced Wednesday builds upon a carpooling system that Waze began testing two years ago in northern California and in Israel before gradually extending it into Brazil and parts of 12 other states. Drivers willing to give someone a ride need only to install the Waze app on their phone. Anyone wanting a ride will need to install a different Waze app exclusively for carpooling. Riders pay a small fee to chip in for gas and other expenses. It’s supposed to be similar to what it would cost to take public transportation to work, according to the company. For instance, Waze typically sets a price of about $8 for a carpooling ride from San Francisco to Mountain View, California – the home of Google and other tech companies. The economies of developing countries like Ethiopia rely heavily on agriculture. More than 70 percent of Ethiopia’s workforce is in agriculture, but 30% are still below the poverty line. After years of flotillas launched from Europe to break Israel’s partial blockade of the Hamas-controlled Gaza Strip, a flotilla has been launched in support of the State of Israel. Israeli and Danish dignitaries on Thursday marked the 75th anniversary of the daring rescue of more than 7,000 Jews from Denmark by boat to neighboring Sweden during World War II. President Reuven Rivlin and Danish Prime Minister Lars Loekke Rasmussen paid tribute to the events in 1943 in ceremonies at the small fishing town of Gilleleje, some 50 kilometers (31 miles) north of Copenhagen. “The rescue of the Jews of Denmark is a remarkable event in the history of the Holocaust, a bright light in the darkest time in human history. Denmark is a shining example of a country that stood at the side of its Jewish community during the Holocaust. The Jewish people and the state of Israel will never forget that,” Rivlin said. Denmark was occupied by Nazi Germany from April 1940 to May 1945, and it’s one of the few European countries whose Jewish population was largely saved from the Holocaust. About 7,200 Jews, or 95 percent of Denmark’s Jewish population, and some 700 of their non-Jewish relatives managed to escape by crossing the narrow waterway from Gilleleje and other coastal spots to neutral Sweden in a risky rescue mission between September and October 1943. Rivlin and Rasmussen laid wreaths at the town’s port Thursday, before attending a ceremony at Gilleleje’s 16th-century church. Some 80 Jews were hidden in the church’s attic while waiting for maritime transportation. “My grandfather was at the synagogue on October 1, 1943, when he found out that he had to flee,” he said. That month nearly 7,000 Danish Jews made the desperate journey by boat to neighboring Sweden. But “in September orders from Berlin were being sent to deal with the so-called Jewish question,” Cecilie Banke, a researcher at the Danish Institute of International Studies, told AFP. She said that plans were leaked from within the German authorities so Denmark’s Jewish population could be warned.